A perusal of the Wikipedia entry for FireWire reveals it to be Apple’s brand name for the IEEE 1394 interface, initiated by Apple themselves as a serial bus interface standard for isochronous real-time data transfer, intended to replace SCSI for connecting data devices while also supporting audio and video applications. However, in certain sectors of the tech enthusiast community, particularly those driven by either love or loathing of Apple and its mercurial leader, FireWire is used as a call to arms, a rallying cry to petition the world against the perceived injustices of a cruel and fickle master towards his loyal followers. Ever since the new laptop line shipped, there has been an ongoing mournful wail of protest at the cheaper, consumer-orientated Aluminum MacBooks with their twin USB ports but the traditional FireWire port deleted. How will we connect fast hard drives? How will we access Target Disk Mode for recovery purposes? How will we offload video from our DV Cameras? How will we survive with the sky falling in on us????? Well, I am not going to rationalize why Apple visited this apparently appalling curse on us all. Limited case space? Shortage of interface chips? Mafia protection racket? A Federal conspiracy by the USB alliance? Frankly, I don’t give a fig why, how or wherefore, I just don’t care. And the fact is that most buyers of MacBooks don’t care either. You see, outside of the Apple community the world uses USB for everything. Hundreds of millions of disks and other devices are connected to PCs every day using USB, and work just fine. Don’t you think if USB was broken, and unfit for purpose, somebody might have noticed? Yes, USB is substantially inferior to FireWire for disk transfers. It is slower than FireWire in the real world, and places more strain on the computer processor during data transfer. But that is irrelevant when you have two honking great computer cores sat in your machine. Apple pundits may dismissively sneer that only a halfwit would trust their data to USB, but the fact is, those who scoff at USB 2.0 for data transfer are just plain wrong. Don’t believe me? I have a Seagate portable hard drive on test here that has both FireWire and USB on board. I transferred 1.76Gb of mixed files (movies, pictures and MP3 files) back and forth between the drive and my 2-year-old 1st-Gen. Core Duo MacBook Pro. The performance differences are marginal at best. Sure, if I was taxing the machine at the same time, FireWire would pull away a bit – but then, these are dual-core machines, so the performance hit would be minimal. What about FireWire audio mixers? DV Cameras? Well, there are USB equivalents to the mixers, and most digital movie cameras now are recording in MPEG and offering transfer via memory card or USB. So again, a minor issue. Besides, most of us only aspire to edit video from our movie cameras – we rarely actually sit down and try to do it. Target disk mode? Are you kidding me? Just pull the drive (easy with the new MacBook) and stick it in a USB enclosure. Or go to a Time Machine/SuperDuper/Carbon Copy Cloner backup on an external drive. Or use Migration Assistant and an Ethernet cable. Target Disk Mode hails from a time when external storage was very expensive, and you couldn’t afford to have external duplicates. That is no longer the case. I am 100% confident that there are many Mac users who don’t own a single piece of FireWire equipment. The port sits there on the machine lonely and empty, while the USB ports are festooned with all manner of electronic paraphernalia. So, is the loss of FireWire on the MacBook a downgrade? Well, yes, slightly (though everything else was upgraded, oh churlish fans). But does it matter? Really? No. FireWire is still around – still on the Pro machines. It is there if you really, really need it. Don’t want to spend that much? You can buy a refurb pro machine for the price of a new MacBook. Get a good one and you won’t notice the difference in performance except if you benchmark. 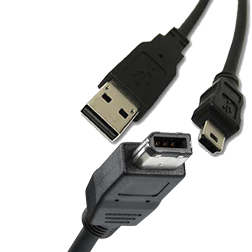 And remember – most of the people buying a new Aluminum MacBook don’t even know what FireWire is, let alone miss it.